It's good to see Alto again using the CD medium to the optimum. Packed to capacity with music from the first half of the last century and under the aegis of one of the grandees of light orchestral music, the disc is the home for recordings made in the 1980s. The results are red in tooth and claw, both as performances and as sound. On the technical side what we hear is quite enveloping, with forthright impact and toasty warmth. 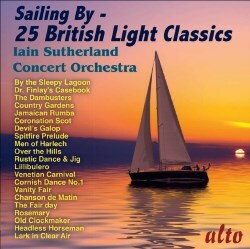 These 25 tracks mix British light music essays both familiar and unusual. Although the performances are listed as by the "Concert Orchestra" they seem to hail from Iain Sutherland's Radio Clyde years as the guiding force behind - and in front of - the City of Glasgow Philharmonic Orchestra. A number of the tracks have, I think, been picked from the same source as four REL/Red River discs. A sprinkling of the tracks have incidental connections with 20th century British radio (Paul Temple, Shipping Forecast, Jennings), the small screen (Dr Finlay's Casebook; The Great War) and the silver screen (Dambusters, Escape to Happiness). Others - the majority - are from the concert hall pastures and pier end theatres. That said, boundaries do tend to blur. Sutherland's Dambusters has the conductor starting as he means to go on. It has an almost tangible groan and rasp¸ a nervously energetic acceleration and an archetypal Coates jollity. Coronation Scot is sumptuous and not short on piston-pounding dash and footplate noises following the continental examples of Strauss and Lumbye. Trevor Duncan's March is a stunner with front-row seats for the listener. I say this even if Duncan must have felt indentured to Wirén and his Serenade for Strings. Duncan opts to deploy a fuller orchestra and makes commanding use of the woodwind. There are three Grainger standards and they are done idiomatically and with jerky spicy spirit. Anthony Collins went to the USA and in recent years his concert hall music has been favoured by Dutton. His Vanity Fair is very romantic, and here is precisely yet pliably pointed. It produces an aural backdrop to the sort of illustrations that decorate a Quality Street box. Elgar's Chanson de Matin points the way towards Elizabethan Serenade and Sutherland imparts to this little song an Ealing Studios dazzle. Provost's Intermezzo from the Bergman/Howard film Escape to Happiness is a lush piece of writing redolent of Korngold. The two Peter Hope arrangements are by no means bland. Lilliburlero comes off as an early morning assault with pipes a-skirl while The Lark in the Clear Air is a winsome pastoral. Binge's Venetian Carnival is a nice piece from a modest start in some disregarded alley before making an entrance full of brash pomp. Ron Goodwin's Headless Horseman owes more than a modicum, with its sinister horror overtones and whip lash and hoof-beat evocation and rumbustious whooping horns, to Arnold's Tam O'Shanter. Arnold's own Cornish Dance is rambunctious and benefits from some incisive rhythmic work. As a child in the 1960s, the BBC's The Great War series made an indelible impact on me. I was delighted recently to discover a whole three-part suite on YouTube. The original music was recorded for the series by the BBC Northern Orchestra conducted by George Hurst in 1964. Wilfred Josephs' March Glorious echoes with the ebullient confidence of the War's early years. The music that stuck with me was the Main Theme which reeks of disillusion. cold and quivering horror. In its implacable bleakness it resembles the opening of the Rite of Spring. Three 'British' composers round things out. Edward German take us to Merrie England and part of the Welsh Rhapsody, the latter known from a famous 1968 EMI LP by Sir Alexander Gibson/Scottish National Orchestra (Classics for Pleasure CD CDCFP4635). Harty was a very fine composer and his sensationally voluptuous Ode to a Nightingale is to be heard in the British Music Society 40th anniversary concert this June. Lighter, but by no means insubstantial, is The Fair Day from Harty's Irish Symphony (Naxos Chandos). The skirls which Harty and Sutherland inject are typical also of the purely orchestral interludes from Roy Harris's Folksong Symphony especially in his treatment of the folk song “Jump Up, My Lady”. Arthur Benjamin wrote a magnificently turbulent Symphony in the 1940s (a nice change from two earlier symphonies: RVW4 and Prokofiev 6) and a saturated Romantic Fantasy (dedicated to Bax) for violin, viola and orchestra. However, his name was kept alive in the most gruelling times by his Jamaican Rumba. Its gently lilting bustle fends off candy floss temptations rather nicely. What a composer he was. These days Alto appears to have cornered the market in this genre and the present CD joins three related Alto volumes (Leroy Anderson; American Light and British Light Music volume 1) and one from Somm (In London Town). The extensive notes are by the conductor who pays tribute to Classic FM for continuing to support the broadcasting of British light music "when other broadcasters often choose to ignore it." John Wilson's BBC Phil efforts on behalf of Coates are an exception and Salford's BBC studios have also kept the flag flying for Haydn Wood and others.